‘ Ike Kupuna, ancestral knowledge: One of the most important features of this banner is to honor kanaka Hawaiʻi and our connections and relationship to elements. Use the banner to illustrate this relationship. Using ‘olelo noʻeau 1690 to connect with deeper thinking and relationships—how could it guide and inform ones decisions/actions. 1690: Ke ‘Eka, makani ho‘olale wa‘a o na Kona. The ‘Eka breeze of Kona that calls to the canoemen to sally forth to fish. Refers to Kona, Hawai‘i. ‘Ōlelo noeau 1099. See Ho’olua on banner. What behavior is represented in this proverb? Would you want to be described as the Ho’olua wind? What might be a time this would not be appropriate? Can you think of a time it may be useful/needed? 1099: Ho‘olua nui. Big Ho‘olua wind. Said of a person who talks boisterously. Using the drawing by Uncle Sonny Keakealani. Choose one wind—what did Uncle Sonny write and how does he describe a particular wind? Name the two winds Uncle Dale Fergustrom says is good for sailing. ‘Ōlauniu…read about this on card and banner? Using your own imagination…draw a coconut leaf that may have been pierced by the wind? Note that on the map this wind does not have a directional arrow. This is because information to date is not clear enough to draw a static direction—which may be changeable or bends and curves. We welcome additional knowledge of this powerful wind. Perhaps someone out there will explore this further. FOR THE RESOURCE CARD ONLY: There is a mistake on the first printing of the Makani card (not banner) that has to do with directions. Can you find it? And what is the correct term? Note: the small compass rose on the photograph is where you can find the mistake. Is it Kona Hema or Kona Akau? USE THE ILLUSTRATION BELOW TO learn about a “pulse rain system” which is different than predictable seasonal rain cycles. 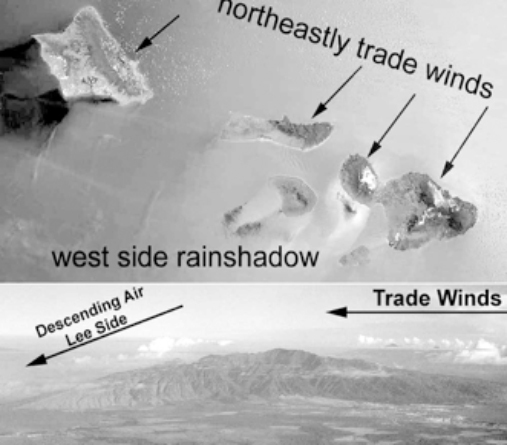 This system, the “rain shadow effect” is influenced by being in the lee of Hualālai, with no regular “rainy season”. This effect influenced different planting methods than the famous Kona Field Systems just a few miles away to the South. Note that these prevailing trades are known locally as “kama‘āina winds” and more specifically as A‘e. Ka Makani mai ka puke wehewehe ‘ōlelo ‘o. Samuel Elbert a me Mary Kawena Pakui. Honolulu 1971. Ua ho‘onohonoho ‘ia kēla wahi puke a Kati Loke Rose, Iulai 1980. Mana Makani: The Power of the Wind. Bishop Museum. This has valuable resource lessons. Olelo Noeau: Hawaiian Proverbs and Poetical Sayings. Mary Kawena Pukui (1983-03-01) An online searchable Kindle edition can be purchased. Nā Makani Mau: Hadley Cell and the Trade Winds of Hawai‘i. Steven Businger & Sara da Silva. University of Hawai‘i at Manoa. Lesson 11-19.